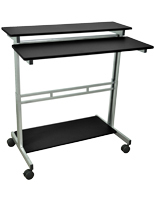 This modesty front mobile work desk is a perfect choice for classroom, office or conference use. 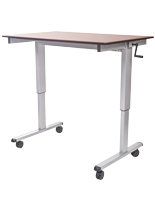 Each adjustable-height sit-stand fixture is 6 feet long and adjusts from a 30” tall to a 38” high tabletop for maximum usability. 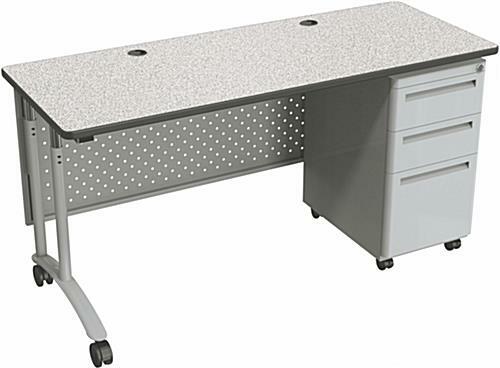 The ventilated front mobile work desk features a gray finish powder-coated steel base with matching privacy panel and scratch-resistant laminate top, with three locking side drawers to keep personal or work materials secure. 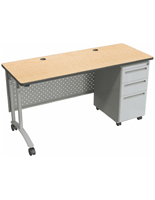 The neutral color of this portable workstation allows it to blend easily with any decor, making it a great choice for businesses or schools. 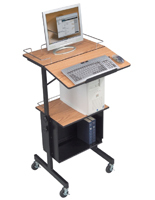 This adjustable mobile work desk’s ergonomic design can be set to different tabletop heights for sitting or standing use. 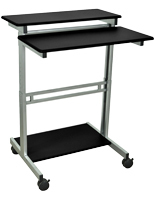 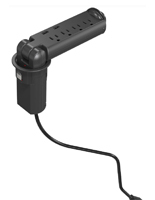 Two lockable rolling caster wheels and cable-management holes make this 6-ft business or classroom furniture piece a great choice for any professional, training, school or conference environment. 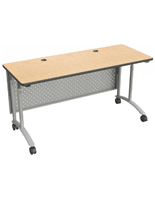 18.0" x 30.0" x 24.0"